The run course is out-and-back. The Duathlon Start is in the Finish Chute. The first 50m of the course is on grass until you turn Left and travel over a small wooden footbridge. The run follows the fitness path towards North Muldrew Lake Rd. Once you make the left turn onto North Muldrew Lake Rd you will continue to run on the LEFT HAND (facing traffic) side of the road at ALL TIMES. North Muldrew Lake Rd. 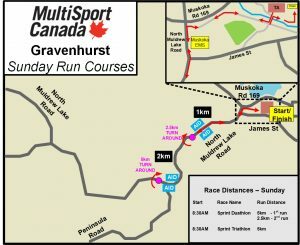 is your typical Muskoka cottage road that has short rollers, steady grades and plenty of twists and turn. Crossing over to the opposite side of the road will be considered cutting the course and may result in a disqualification. 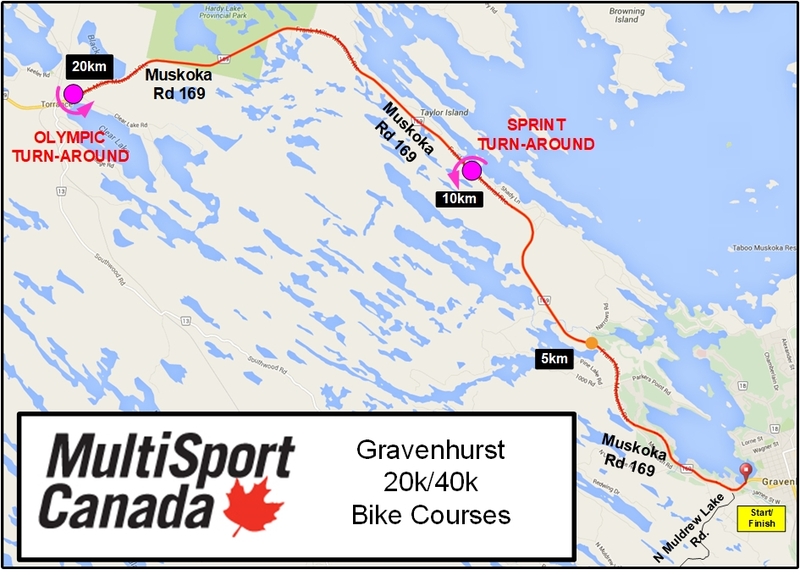 The Turnaround is at 2.5km on North Muldrew Lake Rd. After the turnaround you retrace the run course back to the race site staying on the LEFT HAND side of the road. You then cross the road at the controlled intersection and continue until turning right into the fitness path once again. You will not return to the finish but continue straight into the back end of Transition. There will be Aid stations approximately every 1.25-1.5km on the course with Water and F2C HYDRA-DURANCE™ – click HERE for more information on F2C HYDRA-DURANCE™. 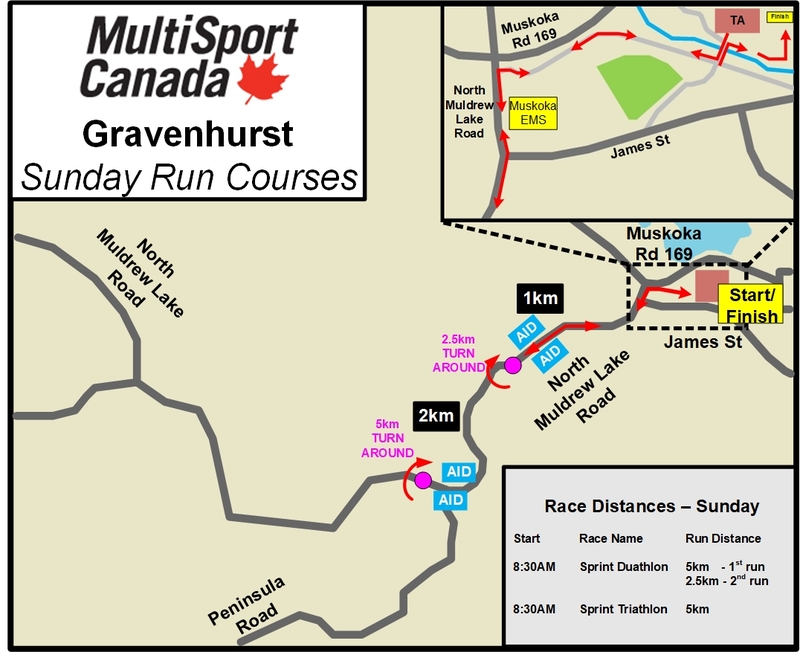 The bike course is an out-and-back along the scenic Muskoka Rd 169. Athletes are always required to stay to the right on the bike course but it is especially important that you do so on this particular course. The run course is out-and-back. You will exit the Transition Area at the back under the Run Exit sign (same way you entered from the swim) and run straight across a small footbridge. The run follows the fitness path towards North Muldrew Lake Rd. Once you make the left turn onto North Muldrew Lake Rd you will continue to run on the LEFT HAND (facing traffic) side of the road at ALL TIMES. North Muldrew Lake Rd. is your typical Muskoka cottage road that has short rollers, steady grades and plenty of twists and turn. Crossing over to the opposite side of the road will be considered cutting the course and may result in a disqualification. 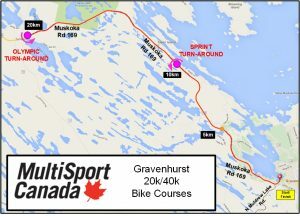 The Turnaround is at 1.25km on North Muldrew Lake Rd. After the turnaround you retrace the run course back to the race site staying on the LEFT HAND side of the road. You then cross the road at the controlled intersection and continue until turning right into the fitness path once again. The final stretch of grass takes you to the Finish Line. There will be an Aid station at 1.25km with Water and F2C HYDRA-DURANCE™ – click HERE for more information on F2C HYDRA-DURANCE™.